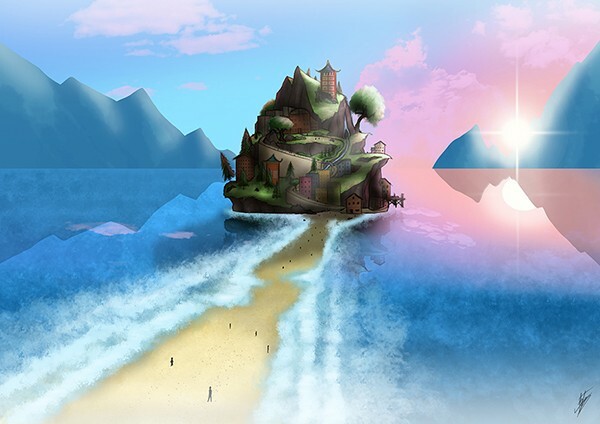 This illustration is of a dream I had last week: some sort of mountain village island with a beach-like causeway leading up to it with people walking along it. As a fantasy landscape based on a dream I thought it would be an interesting and unique thing to illustrate. I’ve depicted dreams I’ve had in the past before in the form of roughly sketched storyboards (something therapeutic about it), but completing this image felt very accomplishing for some reason. I’d like to do more dream-based illustrations in the future, especially if they contain fantastical landscapes like this. I remember a dream a couple years ago where I was in a landscape made entirely of blue crystal with a pink sunrise, so that’s tempting. 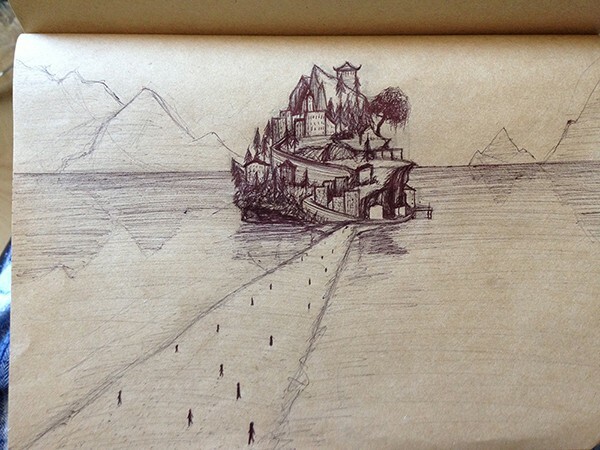 Included with this image is the original half-hour sketch I did in my brown paper sketchbook of the dream, which I immediately got up and drew after waking up.